The colour forecasting process is a major driving force in the fashion and textile industries but is complex, highly intuitive and little understood. This textbook for students of fashion and design discusses the development of the various driving forces of fashion, when colour forecasting began and how it has developed to its present day state. Colour terminology and some of the more subjective tools used by colour forecasters are explained, and their strengths and weaknesses are compared. Also, a model is given of the colour forecasting process and this is discussed in detail. 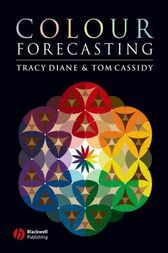 Finally, readers are shown how forecasting methodologies are used to develop 'colour stories'. Tracy Diane BSc, MA, PhD is a freelance designer, colour consultant and researcher. She has a great deal of experience in textile design particularly knitwear. Tom Cassidy MSc, MBA, PhD is Professor of Design at the School of Design of the University of Leeds. He has been in textile and fashion education for twenty-five years following nine years in the industry.